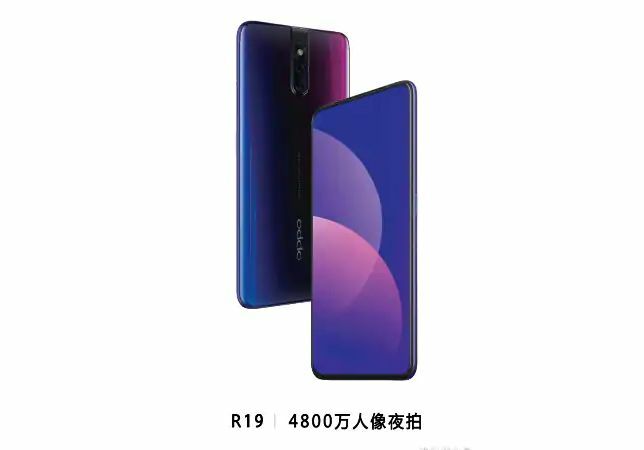 Oppo is going to launch their new mid-range smartphone Oppo F11 Pro which is also known as Oppo R19 in China, according to the leaks the phone will feature 48 megapixel rear camera along with the pop-up selfie camera and notch-less design. 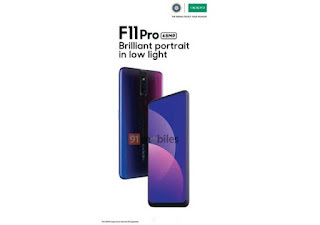 Oppo F11 Pro is going to be a mid-range smartphone which will offer full screen experience to smartphone users. the phone is coming with 48 megapixel primary camera and popup selfie camera on the front side. Chinese social site Weibo shows photos of Oppo F11 Pro from both front and back side, according to these photos the smartphone is to have dual rear camera set up on the rear side and there is no fingerprint sensor on the rear side so the smartphone could come with in screen fingerprint sensor, on the front side there is a popup selfie camera and notchless display. Oppo R11 Pro is expected to have 6.5 inches AMOLED display which is completely notch free and provide full screen experience. Oppo F11 Pro/Oppo R19 is going to be the world's first smartphone to powered with MediaTek Helio P80 processor which will be coupled with upto 6GB of Ram and 128 GB internal storage also the phone will have 32 megapixel front camera, 4,500 mAh battery capacity, super vooc fast- charging and likely to come with gradient colours.